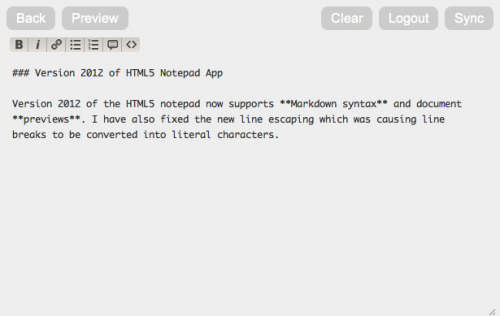 I have released an updated version of my HTML5 Notepad app which features a new user interface, adds support for Markdown syntax (along with a simple editor and preview) and fixes a synchronization bug which in some cases converted line breaks into text. Please note that there could still be some bugs and the code hasn’t been polished for a production use, but it serves as a very useful example of some of the most interesting HTML5 features such as localStorage and offline cache. You can fork it on GitHub or download from the project page.